Guided Climbing in the UK gives you the perfect opportunity to enjoy climbing some of the many classic routes in the British Isles. Travel somewhere new and enjoy climbing on a new rock type in different surroundings. 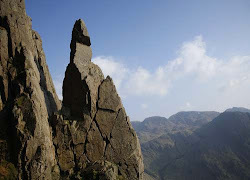 How about Lake District mountain routes, Peak District routes on the gritstone edges, cream teas and sea-cliff adventures in Devon & Cornwall or long mountain classics in the Highlands of Scotland. The following are just a handful of suggestions. I am sure you can think of many more on your personal wish list. For Guided Climbing in the UK you should have previous experience of seconding routes, be able to belay and remove runners.